I feel like the only person, in the whole of England, that laments the passing of the coldest spring since 1963. After ten years of concurrent wasp nests in my house, I officially confess that I loathe the beginning of summer. I was never much keen on them as a child and as the years pass, my transient hatred has developed into a full blown phobia. Growing up, my family would eat dinner outside but any appreciation of those rare balmy evenings flew out of the window as quickly as the wasps invading the table. I was the source of great amusement, leaping up at the first sight or sound, hysterically running away oblivious if they were even following. As adverse shocks go, there’s nothing more distressing than the menacing buzz of an aggressive wasp and subsequent head-snapping when fervently trying to locate its source. The involuntary physical reaction of seeing their yellow and black abdomens, hideously swaying, sets off a pounding heart combined with alternating hot and cold flushes. As warm sunlight filters through my bedroom window this spring, memories instinctively return to the places I’ve unexpectedly discovered them in previous years; on toilet paper, towels, inside make-up bags, a bedside lampshade and it’s this that exacerbates my fear. Once, after spraying one with insecticide, it sped upwards getting caught in between a spotlight fitting and the ceiling, above my bed, where it preceded to hang, half in and half out buzzing manically as the poison took hold. The thought of it dropping onto my bed, dead or not, in the middle of the night helped rationalise the desperate solution of calling upon my well-known cab company who sent over a kindly driver to dispose of it. During the summer of 2002, I discovered a number of wasps scattered in the lounge. I vaguely wondered why so many came to be in the room but wasn’t overly concerned as the insidious insects were very much dead so just closed the patio door thinking no more about it. Upon discovering more dead wasps the following day and then the next, the penny dropped that there must be a nest. Everywhere I went that summer, the wasps seemed to follow, even the first pest controller I ever encountered, had a sunken face, beady eyes and a sharp chin resembling a wasp who’d been infected with human DNA. My horror stories know no bounds, from the night in a restaurant when I spat out wine after tasting a furry object in my mouth which was a probably drunken, but thankfully, dead wasp to one flying into to my car after I’d finally succumbed to opening the window on a baking hot day. Light fittings are a good entry point as I found out in the middle of one night, unfortunately, I was a little bit drunk so the incessant buzzing seemed part of my dream until I was stung, which was immediately sobering. Every outside social activity brings about a set of challenges, do I take with my electrified tennis bat that, with one swing kills them outright (as long as you don’t miss) or tell all and sundry that I am allergic to them, thus rendering enough sympathy that guests are willing protectors for the duration. Either way, these events are usually marred by my hyper-vigilant state. Suggestions from pest controllers included garden pots filled with a sweet liquid designed to lure, then trap, unwitting wasps into sugary suffocation. Mostly, wasps are in abundance during late summer when they are scavenging for sweet foods so this method would not stop a queen from procuring her nest in early spring. Then there was the fake wasp nests made of paper, the theory being that a passing queen will jog on believing it is already populated but my own theory concluded that, if I could see the nest was fake, probably a wasp would too. The only course of resistance at home was to have fly-screens installed, those ones usually reserved for Americans dealing with hornets, killer bees and other unmentionable international insects, extreme maybe, yet effective in stopping them entering by conventional means. I’ve had pest controllers tell me that I can’t possibly have a nest because it’s only March and there aren’t any wasps in March and the silence is deafening once I explain that I have kept the dead ones ready for inspection and, err, how else did they get inside the house when the windows are protected by screens. Wasps aren’t like rats; they don’t force their way into your home but inadvertently drop in via chimneys, turrets, air-bricks and lofts if a nest is nearby, they’d rather be out than in too. It is not easy finding a nests’ entrance in early spring because occupancy is small, perhaps just 100, and pest control companies make their money upon treating the nest so if they can’t find it, they go away empty handed. It’s a time consuming pursuit, walking around the house trying to spot where they are flying in and out from. If that’s unsuccessfully, you literally have to stand patiently until you spot one and then follow its flight path to or from the nest. If you spot a lone wasp hovering around a roof tile or a hole in the brickwork, it is a soldier guarding the entrance from potential threats. Nest hunting is best done when the sun is out and wasps are actively foraging. Bees are fat and fluffy, their gentle buzz a flowery hum as they busily collect sweet nectar and rarely sting unless a swarm is threatened. They lose their abdomens along with their sting and self interest doesn’t usually include committing suicide. Wasps don’t and can also sting multiple times, nor do they swarm and when under attack, send out pheromones that recruit nearby wasps. 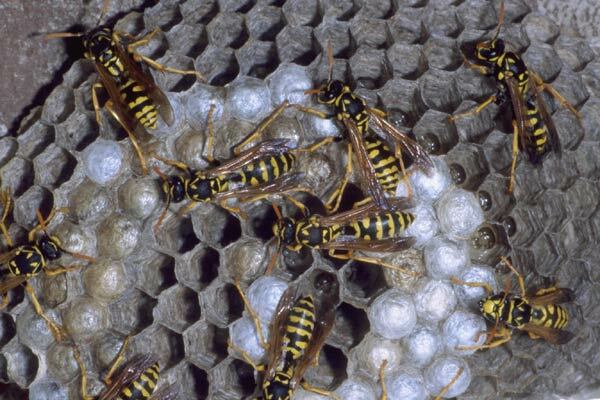 May is prime nest making month and when I am reduced to furtively entering each room listening out for the tell-tale buzz, because why should this year be any different.